Asbestos is a naturally occurring fibrous mineral that was formerly used in property construction because of its resistance to heat, electricity and chemical corrosion. It was also used as an insulator in roofs and on pipes or electrical wires. Now banned due to its carcinogenic properties, there are still a lot of properties where asbestos can be found. Being able to identify whether you have asbestos in your property is crucial, especially if you are selling it, and should be carried out by a trained professional. 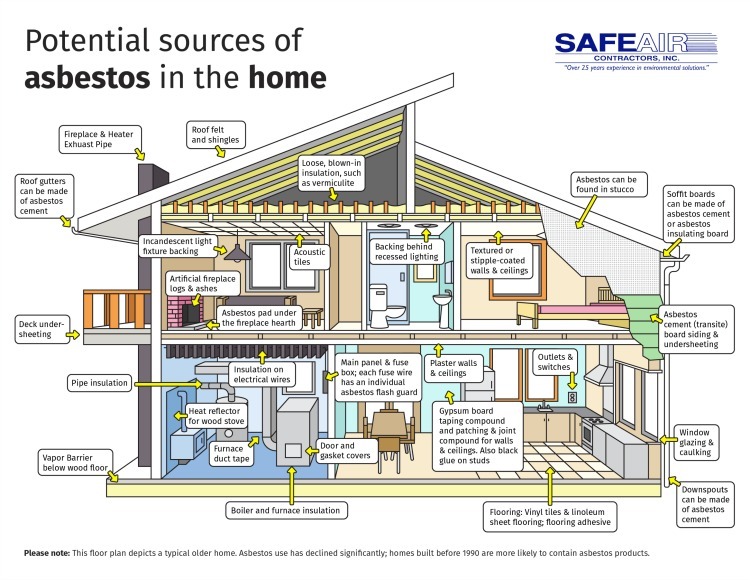 How do you know if you have asbestos in your property? If your property was built or refurbished before the year 2000, there is a chance you could have asbestos. The three main types of Asbestos found in residential properties are white, blue and brown. • Chrysotile (white asbestos). Chrysotile is the most commonly used type of asbestos. The fibres are usually fine, highly flexible and are resistant to heat. It is commonly found in cement and roofing materials. • Crocidolite (blue asbestos). Crocidolite has very thin fibres that can easily get lodged in the lungs, if inhaled. These thin fibres and brittle texture mean that it can easily break down, leading to people being exposed to it which can be very dangerous over time. • Amosite (brown asbestos). This form of asbestos is particularly strong and heat-resistant leading it to be commonly used in cement sheet, plumbing and electrical insulation. All types of asbestos are toxic when released or disintegrating, therefore you will need a specialist to look for and remove any of it within your property.